Life can be busy. School, job, deadlines, traffic, parking meters, it can feel like we are living life on a series of timers sometimes. It’s no wonder that we often find ourselves feeling worn out and sluggish. I’m a HUGE advocate for Self-Care. I’ll admit it’s something that I have struggled with since entering into my adult years, but more recently I’ve started to notice that my physical endurance takes an actual hit when I fail to take the time to nourish and reboot. Let’s be honest though, most of us don’t have the time to take off for a spa day as often as we’d like. I also really absolutely adore my work, so I don’t like to take time away and when I do, I’d rather just hang out at home and practice recipes in the kitchen, or indulge in the latest historical fiction book on Amazon’s best sellers list (I’m a nerd, I can admit it). It’s the small things done over a long period of time that have the largest impact on our health. Start your morning off with a cup of warm water, 1 tbsp of Apple Cider Vinegar and 1 drop of Lemon or OnGuard Essential Oil (I use doTERRA). This morning ritual helps to gently stimulate digestion, harmonize the pH in your gut and also get your digestive enzymes naturally revved up and ready to take on your morning nourishment. For all you coffee drinkers, I recommend adding a few powerhouse bonuses to your casual cup of joe. You’ll feel better AND reap the benefits of a more balanced boost rather then one that often results in the jitters and anxiousness. -1 tsp of mushroom herbs like Chaga or Cordyceps. My favorite brand right now is Root and Bones. Their herbs are clean and absolutely delicious! This one is a little bit more difficult for people to abide by, but trust me, your skin will thank you! Try and stick with mineral water or reverse osmosis water that has a sprinkle of Pink Himalayan sea salt in it (this remineralizes the stripped down reverse osmosis water). Gratitude carries high frequency. When we are in a state of gratitude, we shift our vibrational frequency to one that fosters joy, peace, health and abundance. I like to write down things that I’m grateful for each day. I do this my Speed Dial the Universe journal. This journal has a daily prompt to write what I’m grateful for each day. It’s amazing how different I feel after completing this single section of the journal prompt. I also like to pair the gratitude exercise with an Aromatic Anchor. An Aromatic Anchor helps to “train” your brain to associate a specific emotion with a specific scent. That way, after a while, you can smell the aromatic anchor and shift your state quickly, in case you are on the go and wanting to recreate that feeling instantly. My current aromatic anchor for gratitudes are doTERRA’s Balance and Align blends. They are both refreshing, ground and calming. There is something so luxurious about creating my evening tea tonic. Preparing the hot water, adding the raw honey and the essential oils to my warm water is both soothing and calming. I use OnGuard blend in my evening tea to help my immune system work efficiently during the night. Additionally, the Cinnamon essential oil that’s in the OnGuard blend helps to balance blood sugar. I’ve noticed that I don’t wake up at 3AM now that I drink OnGuard at night. The 3AM wake-up is often indicative of unstable blood sugar patterns. I also use Lavender essential oil in my Tea, this helps to calm me down. I’m an overactive thinker and my brain has a very difficult time turning down the chatter. Lavender essential oil helps to promote GABA in the brain, the neurotransmitter that dims down the mental activity so we can get to sleep with greater ease. The simple act of taking your daily vitamins offers your body the baseline support that most of us are lacking with our nutritional intake. The nutritional value of our food is so poor that the Scientific American has said that one orange from our grandparents’ generation has the nutritional equivalent of 8 oranges today! -Bonus (but seriously needed): take a natural anti-inflammatory. Think: turmeric, green tea extract, green tea extract, boswellia and polyphenols. All these natural elements help to support the modern day body that’s fighting excessive toxin exposure and high stress. 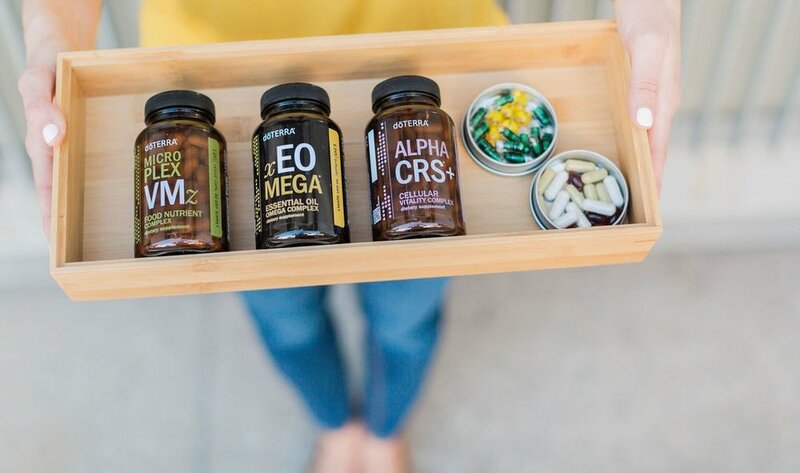 If you’ve been looking for a way to reboot your Self-Care System with total ease, doTERRA just came out with a Daily Health Habits Kit. It has a lot of the items I mentioned above plus some extra bonuses. If you don’t already have a doTERRA account, just click here to contact my team. Myself or a team member will help you get started.